Lawson, Christine Ann (2000-09-01). Understanding the Borderline Mother (p. 289). Jason Aronson, Inc.. Kindle Edition. Technically, a Narcissistic Mother (NM) would be a mother with a high level of narcissism and, possibly, a Narcissistic Personality Disorder (NPD), which would require a diagnosis by a mental health professional. This may be in many cases too extreme and too narrow a definition. We would define a Narcissistic Mother more broadly as one who, rather than build up her children and equip them for an independently happy life, shapes them to satisfy her own needs. The narcissistic mother will smother, ignore, punish, envy, control, stifle, and even break the confidence of her own children if necessary. Most of the time, this behaviour is unconscious and self-justified. In other words, while the 'good enough' mother teaches her children to fly on their own, the narcissistic mother either clips their wings or attaches a string to their legs so that they will never fly away, and may see nothing wrong with that. She may even trully believe that she is a loving mother. The Destructive Narcissistic Parent creates a child that only exists to be an extension of her self. It's about secret things. It's about body language. It's about disapproving glances. It's about vocal tone. It's very intimate. And it's very powerful. It's part of who the child is. 8. She's a liar in too many ways to count. 11. She's selfish and willful. 16. She's infantile and petty. 21. Sometimes she seems to have no awareness that other people even have feelings, and other times she is brilliantly sensitive to other people's emotions. 22. She manufactures “no-win” situations. 23. She's shameless. She doesn't ask. She demands. 25. She destroys your relationships. 26. As a last resort she goes pathetic. Overall, a narcissistic mother is a mother who, instead of nurturing her children, is mainly or only focused on herself. Imagine a person in survival mode who cannot therefore look after anyone else for fear of death. The NM either uses her children or tries to destroy anything in them that she perceives as a threat. You are seen as either with her or against her. Attention and "love" are the rewards for compliance and good service. Negligence and abuse are the punishment for trying to separate, and not being of use. Although abuse is also seen as useful when the NM projects her negative feelings onto her children. Overall, the NM is too caught in herself to be aware and interested in her children's feelings. This is character and soul destroying for us, the children. The most difficult is to accept that our mother, who can pretend or occasionally appear to love, isn't capable of true, selfless, and unconditional love. She never will be. We must find love elsewhere. Maternal love is not a reality in our lives. But true love from other sources, including ourselves, can be part of our lives. Maybe the biggest lie ever told, and believed, is that all mothers love their children. In spite of all the cases of abuse, of neglect, and sometimes murder, society is in denial. Denial is the first, and possibly biggest, hurdle we have to jump on our way to freedom. Dr McBride is careful to explain that a NM can be “primarily one type or a combination of several of these”. More broadly, she sees two opposing types of parenting by NM: over-parenting by the “engulfing mother”, or under-parenting by the “ignoring mother” (McBride, p37). 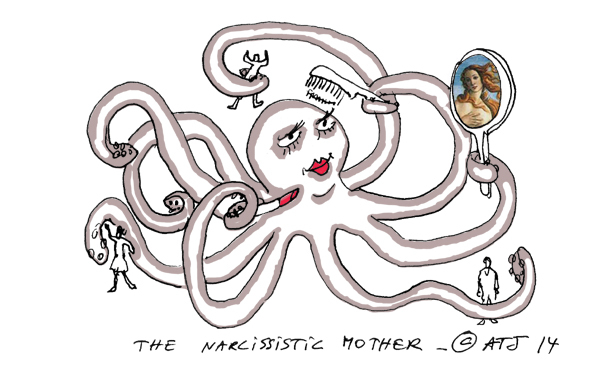 All of this shows how different each one of our narcissistic mothers can be. Added to this is the fact that the NM, like all narcissists, does not want to be unmasked, and will therefore deny and hide her narcissism. Let's not forget that the narcissist spends a lot of energy maintaining the illusion of their false self. It is a question of life or death for them. On top of this, there is the entourage's denial. Most of us had to deal with our friends saying: “But your mother is great!” This makes it really difficult for children of narcissist to acknowledge the truth, and overcome their own denial and doubts. Validation is key to us. Sadly, like for most things, we have to rely mainly on ourselves for validation. We need to trust ourselves in the labyrinth of deceit created by the narcissist. Thankfully, there seems to be a growing awareness about NMs. Books, websites, blogs, etc., and finding a therapist who understands these issues (and may have themselves personal experience of living with a NPD), can help us greatly in the process of validation and recovery. Narcissistic Mothers are emotionally immature. This becomes particularly obvious during some episodes of narcissistic rage or other circumstances where the mask is lifted for a while (for example when they are physically hurt or scared). You may suddenly feel that you are dealing with a little girl or an adolescent at best. In some circumstances, even the voice of the NM changes and sounds like that of a child, or the vocabulary is that of a child. For example, after a fall, a NM may call for her mommy in a childish voice, just like a little girl would. One tip for dealing with a NM as an adult is to see through the curtain of deceit: Imagine that your mother is a six-year-old hiding in the body of a grown-up. Suddenly, her abusive words and her crazy behaviours can be seen for what they are. If you've ever seen The Wizard of OZ, you will remember that OZ was in fact a weak and frightened little man hiding behind the mask of a frightening wizard. Once the mask has fallen, there is no reason to be sacred or intimidated anymore. Labels and categories, or types, are quite useful, but may sometimes be reductive, misleading, and confusing. 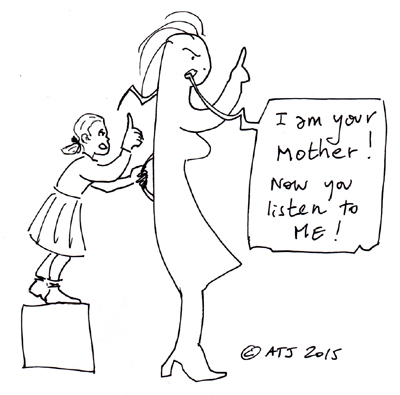 This seems to be true about the distinction between narcissistic mothers and borderline mothers. Many people with borderline personality disorder (BPD) also seem to have a narcissistic personality disorder (NPD). In fact, depending on the source and the study, the "co-morbidity", or co-occurrence, seems to vary between 15% and 39%. The higher results come from research including NPDs that are not aware of their condition. Whereas people with BPD are more willing to confront their condition, NPDs rarely do, and therefore it is quite difficult to measure. Whichever way you look at it, there are good chances to have a mother with both disorders. 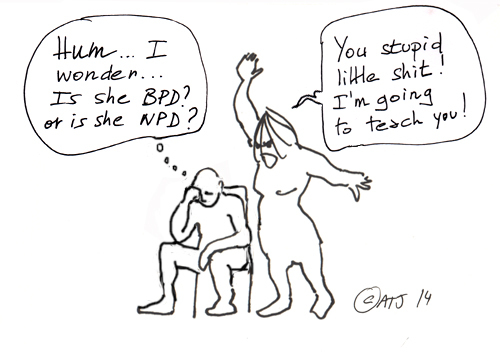 For some adult children in particular, the distinction between BPD and NPD is unclear. For all these reasons, we feel it important to also look at borderline mothers in our examination of narcissistic mothers. "BDP or NPD? That is the question..."
While the Waif and the Hermit belong more clearly to the Borderline category, and, as archetypes, don't appear to belong to the NPD category, the Queen and the Witch, on the other hand, are very reminiscent of narcissistic mothers. Like me, you will make your own conclusions from your readings. Each one of us has a different mother who falls in her very own category. I'd say that mine is a Queen and Witch, Secretly Mean narcissist. But originally, before hearing about narcissistic mothers, I would have just said that she was very "special", sometimes mad, sometimes like a six-year old, and sometimes very inconsiderate. One day, I typed "Bully mother" in Google and I discovered the concept of NPD mothers. It was like a revelation. In the following days and weeks I went through what felt like an epiphany. I had some "ha-ha" moments and was quite overwhelmed with feelings. One was a feeling of liberation and hope "the truth will set you free" came to my mind many times. This was in January 2013, at the age of 43. I have since started a psychotherapy with a therapist familiar with children of NPDs and who amongst other things has attended trainings at the Meadows with Pia Mellody, author of Facing Codependence and Breaking Free. I've also started attending CODA meetings. Starting this website is part of my recovery. It helps me understand my story but it is also an attempt to share and learn from other ACoNs. Understanding my mother's "condition" and learning how to deal with her is one of the great challenges. I have not gone "No Contact" (NC) in spite of her continuing covert and destructive manipulations. When I first "discovered" that my mother was NPD (as I understand NPD), I tried to share this with my elder sister and my much younger brother (the golden or all good child). I sent my sister a copy of Karyl McBride's book for narcissistic daughters. Even though I don't agree with Dr McBride's take on SoNMs, I thought this would actually work for my sister who is quite obviously convinced that my brother and I ("the boys" as she calls us) had and continue to have a much easier ride than her (It's funny how she remembers all the terrible things my mom did to her but she can't remember that I was badly treated too, even though for example she was there for most of the beatings). But my sister read "my" book and wasn't convinced. She said that it wasn't really our mom in the book, that the author herself still seemed to have quite a few issues, etc. I didn't want to argue with her on this. I accepted her view as her view. In the same way that I accepted that my brother said he didn't have the energy to look into this. Unfortunately, both my brother and sister have since spent a summer holiday with my mother. Since then, my brother and I haven't really spoken even though he came to live 300 yards from where I live. My wife and I used to see them every other week-end. We would babysit our new-born niece sometimes for an entire week-end. We haven't been asked for a single babysitting since last summer. My mother is coming from abroad to look after her for a week-end while my sister in law is away. Nothing was said clearly to us. We just had to witness the difference in attitude. When my wife raised something with my sister in law it was met with a firm rebuttal, a very aggressive denial and counter-attack. My mother never questioned why we don't see them or her granddaughter anymore. Because she knows. I don't know what she said or what she did. We believe that someone must have told her that we suspected she was NPD. Did I mention that my mother is a self-taught psychotherapist? She claims to be really very good, to heal people who've been in therapy with others for years in a matter of weeks. So she knows even better than most how to get into someone's brain. Sometimes she makes me think of Dr Hannibal Lecter in the Silence of the Lambs. But there is a limit to what she can destroy. Yes, she can manipulate my brother, my sister, their spouses and children. But she can't get to my father anymore (he died of cancer 7 years ago - Apparently I had something to do with it, my mom said to me once). I can only look at all this in sadness. I am determined not to let her trigger me anymore. I am lucky to have a wonderful and loving wife. She suffers with me, but she understands and sees what is going on. We never had children and in a way it comforts me to know that the cycle is broken. Only our dogs had to suffer my rages when they would crap in the dining room. I try to repair those episodes of abuse. My dogs have taught me that love is about rejoicing in seeing them happy, regardless of me. I am wounded, damaged and fighting for a way out of misery. I am hopeful. I understand better what my life has been about. I feel for all who haven't had the love of a mother. I am not alone anymore. 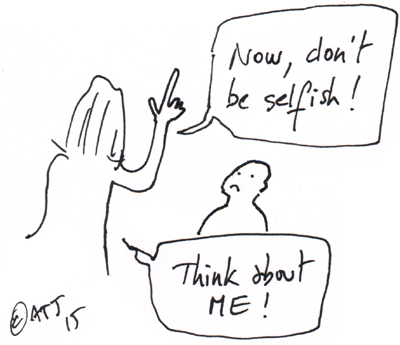 Are you the son of a narcissistic mother? Do you recognize her in the lines above? Let us know.